Early Australian Linens - a private collection. : Surprise visitors to the Gallery. Surprise visitors to the Gallery. The first three days of my exhibition had a steady flow of visitors, and I thought the weekend would be busier, but today (Saturday) was the quietest day I have had so far. But my visitors were very special. The first surprise was a lady named Sylvia who is a regular on the opshop blog that I follow, and I knew she also collects linens. She and her hubby arrived and introduced themselves as soon as they walked in. The funny thing was, I was expecting another blog friend named Sylvia, and not having met either of them before (or seen photos) I assumed this lady was my friend! But she cleared up the misunderstanding when she said she was 'Sylvia from the Op shop blog'. She had a gift for me - two doilies she'd found at opshops - how sweet is that! 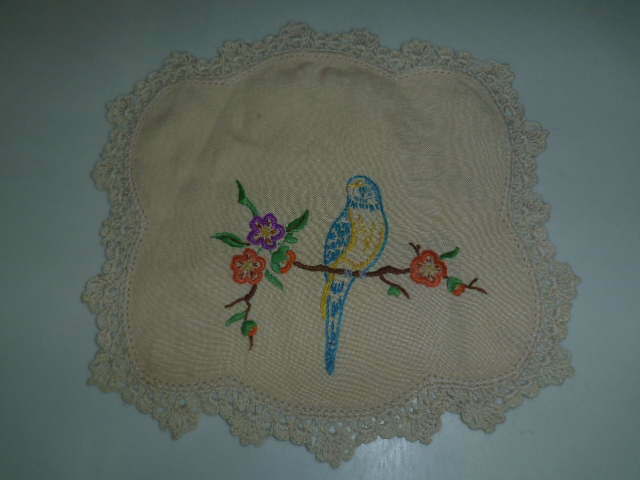 One was this gorgeous little budgie doiley with hand crocheted edge, and the other was the same as one of mine on display (Brisbane 1932), but mine is not in good condition, so Sylvia found a better one to replace it! An hour or so later, I had a call on my mobile from "the other" Sylvia, who had come down from Sydney with her daughter for the day, just to see my linen exhibition!! They had done their homework and knew which tram to catch, and where to get off the tram, but the park where Bundoora Homestead is located is quite large, and they headed off in the wrong direction. Luckily I'd given Sylvia my number in case they got lost, so I jumped in my car and rescued them. In my excitement at meeting them, I took a wrong turn and ended up in a street behind the homestead, so made a quick U-turn with nearly disastrous results. I hadn't noticed (be truthful Gina - hadn't LOOKED) the Mercedes behind me, but fortunately for both of us, he was alert, and avoided crashing into me. I felt such a fool and very sorry to have given my friends such a fright, but they assured me there was no harm done, and laughed it off. Thanks again Sylvia and Susan! Once back at the homestead gallery, my visitors enjoyed looking at my linens, and I presented Sylvia with some Royalty memorabilia linens that she didn't have in her collection. 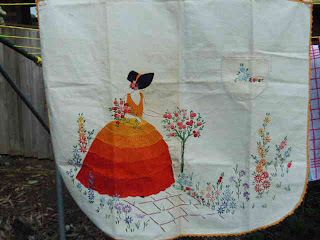 In exchange she gave me an unexpected gift - this stunning embroidered apron which I had admired on her blog recently. I was speechless!! It is one of the most beautiful aprons I've ever seen, and will have pride of place in my collection. I can't wait for the next fund raising event we are having for the Guild, where some of my aprons will be modelled by Guild members for an afternoon tea entertainment. This apron will be first off the rank! As it was so quiet at the Gallery, I took time off to have a coffee in the cafe with Sylvia and Susan, and we spent a happy half hour chatting about blogging and other interesting topics. Just before they departed, my third surprise visitor arrived - the MOTH. He hadn't said anything about dropping in, but it was a lovely sunny day, and he said it was better than moping around the house feeling sorry for himself, so he came over. He met Sylvia and Susan, and admired my display while I drove them back to the tram stop, then Ken and I went home. All in all, a very pleasant day. Gina, it was so very nice to meet you. Susan and I had a wonderfull afternoon looking at your collection and enjoying Devonshire tea with you. Thanks for coming to our rescue when we were lost in the grounds of beautiful Bundoora house and driving us to the tram stop later.